I spent the weekend (4 days) training in Squamish with the rest of my SAR team on helicopter long line rescue. Readers of the blog probably know that I’ve been doing this type of rescue for a while now (since 2004) – I attended the course as part of a recertification, and as a team building exercise. The course, delivered by Emergco, and taught by instructors Bill Mark and Gavin Reed, was intense, thorough, and very complete. We went through risk analysis exercises, scenarios, “dry land” training with a hoist, and live training. Even though I’ve done upwards of 30 missions (training and rescues combined), I found the course extremely valuable. The insight of two backcountry professionals such as our instructors was hard to beat, and I also learned from the 10 other highly experienced SAR members taking the course. 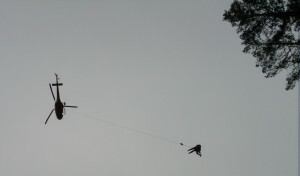 You can see me being picked up and slung into a rescue site. As I’m being lowered I halt, and throw a tag line which allows the ground SAR member to guide me in. The reverse is done as I’m being lifted — I pause and release the tag line, and am slung back to the staging area. I would love to do a Rescue Course like this. So cool to work with the helos.